INTRODUCTION: Single Feed Enzymes Nutrizyme PRA (acid protease) is made from Aspergillus niger through fermentation and extraction technology. Nutrizyme PRN (neutral protease) is made from Bacillus subtilis through fermentation and extraction technology. Enzyme For Animal Feed Proteases are very important in digestion, which can hydrolyze long protein chains into short peptides and amino acids, promote animals to digest proteins of feedstaff. According to different pH of catalyzing reaction, Animal Feed Enzymes proteases can be classified as acid proteases, neutral proteases, and basic (alkaline) proteases. 1 unit of Acid Protease equals to the amount of enzyme, which hydrolyzes casein to get 1 μg of tyrosine in 1 min, at 40℃ and pH 3.0. 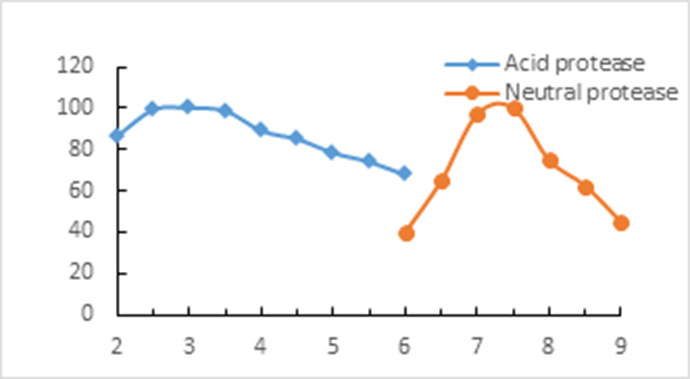 1 unit of Neutral Protease equals to the amount of enzyme, which hydrolyzes casein to get 1 μg of tyrosine in 1 min, at 30℃ and pH 7.2. Acid protease: 10-25G/MT of complete feed; or add according to the formulations of various ingredients. Dilute the concentrated enzyme before use. Neutral protease: 10-15G/MT of complete feed; or add according to the formulations of various ingredients. Dilute the concentrated enzyme before use. 1. Hydrolyzed proteins in feed effectively, improve protein digestion of animals. 2. Complement the shortage of endogenous digestive enzymes, reduce the risk of diarrhea, and promote animal growth performance. 1. Packaging specification: 25 KGS/Bag. Looking for ideal Improving Protein Digestion Manufacturer & supplier ? We have a wide selection at great prices to help you get creative. All the Hydrolyze Long Protein Chains are quality guaranteed. We are China Origin Factory of Complement Endogenous Digestive Enzymes. If you have any question, please feel free to contact us.